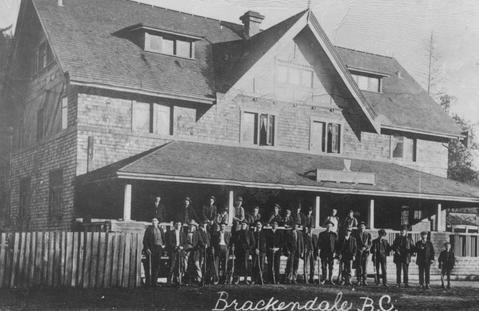 Left to right, back row: ?, Charlie McKinnon, Fred Downer, ?, Wilfred Rae, ?, Earl Parkest, Lance Bracken (architect who designed hotel). Front row: Mr Hickey, Bert Rae, Albert Edwards, ?, Bob Hutchinson, Charlie Clerk, Hughie Mills, Al Armstrong, Chief Long George, Fred Thorne, Tom Brett, Bill Mallett, Mr Blodgett. Those thought to be in the picture although position unknown: Cliff Thorne, Bert Perkins, Harry Judd, Jack Edwards, Wilbie Judd, Fred Magee, John Bracken, Jack Habricht, Charlie Fairman, Jack Greer, Ralph Brereton.